Cookies are definitely a fave of mine. In fact, cookies paired with milk are the perfect evening snack that a mom and kids can enjoy together. I’m not talking about that store-bought stuff, but the real, home-made goodies that every child dreams his mother will have waiting for him at the door when he comes home from school. Sure, the thought is nostalgic, but there are a lot of warm-fuzzy memories associated with home-made cookies. Why not keep the memories alive and surprise your munchkins with some home-made cookies? Here is a fun post from Lauren at Daisy Cottage Designs This girl knows how to bake up the cutest cookies on the planet. So glad she’s here to share one of her favorite go-to cookie recipes with us! One evening, not so long ago, my husband and I were in the mood for some dessert. We couldn’t quite decide what we wanted for our treat — we talked about ice cream and a couple other things. In the end, we decided to go with cookies. 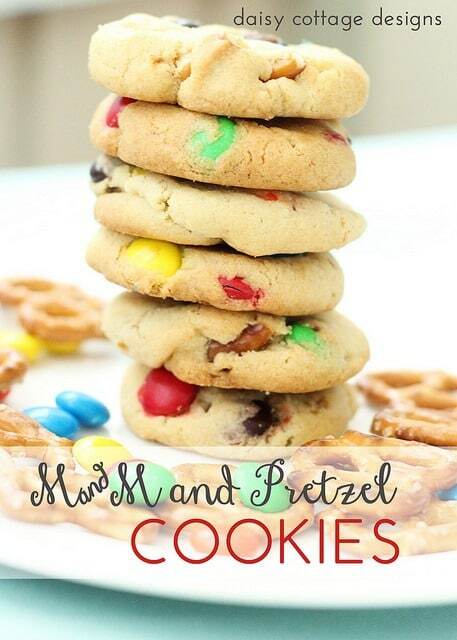 I didn’t want to make our standard chocolate chip cookies so I went with something new — M&M and Pretzel cookies (not to be confused with cookies made with pretzel M&Ms). My little girls, Riley and Caroline, are 3 1/2 and 1 1/2 and quite the cookie lovers. If we let her, Caroline (the baby) would eat “tookies” all day long. Riley, while still a fan, would choose an apple over an Oreo (oh how I wish she could say she inherited this quality from her mother!). When we find a food that is loved by all in our family, we stick with it. This was one of those treats. And let’s be honest — can you really go wrong with M&Ms? In a large bowl, cream together butter, white and brown sugar. Mix in eggs and vanilla. Combine baking soda, salt and flour in a separate bowl. Stir into wet ingredients. Add flour until the mixture gradually. Fold in M&Ms and pretzel pieces. Roll into balls and place on an ungreased baking pan and bake for 9-11 minutes (10 is perfect in my oven) or until the cookies are a light golden brown. The batch makes approximately 48 cookies (but this depends on how much dough you eat—not that I eat any cookie dough or anything). These Spring cookies are perfect treats for your children or an entire class, package them up in a baggie, and attach a “one smart cookie” label to the top. You can find one example here. The touch of cuteness will remind kids that school is still fun — even in the Spring! Want more kid-friendly recipes and craft ideas? Follow Lauren on Pinterest or Daisy Cottage Designs.